When you click the Start menu--or visit the Windows logon screen--you're presented with a rather arbitrary thumbnail image. Usually it's a flower, soccer ball, rubber ducky, or one of the other handful of Windows' stock images. 2. Click Change your picture. 3. If you don't want any of the available thumbnails, click Browse for more pictures. 4. 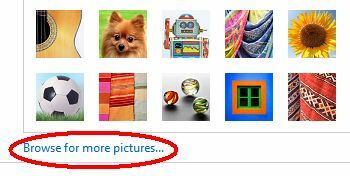 Navigate to the desired folder and choose the image you want. Any BMP, GIF, JPEG, or PNG file is fair game. That's all there is to it! Now you can customize Windows to be just a little more the way you want it.